Salonwear has created an extensive range of beauty salon apparel for many years. We combine latest technology with trendy designs to create salon products that stand apart from other such products in the market. Our clients have always appreciated our products and with their continued support, we are now offering a new and truly unique spa and beauty salon apparel, the barber smock. Our new product has been designed keeping in mind the traditional barber jacket and enhanced with some stylish features to give the barber jacket a whole new look that you’re bound to love. Made from one of the highest quality fabrics, our barber clothing is a perfect choice as it is not only practical but also comfortable. Salonwear has closely studied the features of a classic barber jacket and has created a product that checks all boxes. Our jacket has top-quality design and features, making it one of the best clothing for barber available at very reasonable prices. What are We Offering in Barber Clothing? A barber’s job can get quite messy at times, whether it means shampooing a customer’s hair or tending to a client’s beard. You never know when an accident may occur, ruining your clothes from any type of spillage. Salonwear provides the perfect protective salon barber apparels to ensure that you are safely shielded from such accidents. Apart from barber smocks, we have big shirt type salon smocks, super coats for beautician, zip smocks for salon, hair stylist caftans and lab coats for salon artists. These classic barber jackets are hip-length, with front pockets to store all your pieces of salon equipment methodically. The front zipper allows the user to wear this vintage barber jacket with complete ease. The well-designed construction of the jacket allows one to move around hassle-free. This barber smock is a steal for its price and you won’t find it anywhere else. If you’re looking for wholesale jackets for salon barbers, you’ve come to the right place! Salonwear’s barber jacket is made from exquisite iridescent silkara fabric: a polyester and nylon fabric that keeps the user safe from chemical and stain spillage. This unique feature of the jacket is an added advantage. This cool barber jacket is made from breathable fabric, allowing you to stay cool throughout your daily activities. The lustrous finish of the fabric adds a touch of elegance to the barber smock. The jacket is easy to wash and dries quickly. The Salonwear vintage barber jacket is available in a classic black color. Three sizes are available for this product: medium, large and extra-large. Personalized Your Barber Jackets ! Promoting one’s business in unique ways is always the dream of any entrepreneur. Here at Salonwear, we help you achieve exactly that. With our unique option of customization, you can personalize your salon apparel with your brand’s logo. 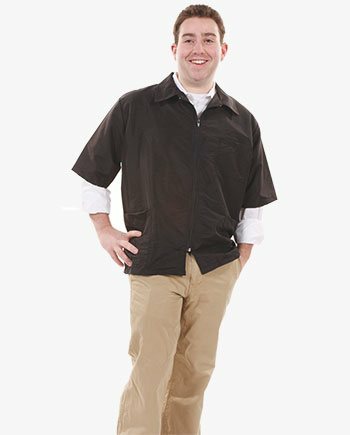 Stocking these uniform barber smocks in your salon or spa will surely impress your clients. The two methods by which we personalize our apparel are screen printing technique and embroidery. Why choose Our Barber Apparel? Salonwear has been the front-runner for the last 31 years in the beauty salon and spa industry in the US. Our sophisticated and functional products have made us the favored go-to organization for delivering the best salon apparel to our clients. Our top quality products have catered to the needs and requirements of our clients successfully and we strive to achieve the same in the future. Salonwear is a family owned and operated business that treats each of its clients as family. We provide only premium quality products and great customer service! Stylish and funky hair salon aprons, hair cutting cape that catches the hair, jackets designed specially for salon artists, salon hair stylist vests, no slip running headbands for spa etc..